After five years of gamifying location-based sharing, Foursquare is today making its biggest change to date. Everyone, please meet the new Foursquare, a recommendations app that has nothing to do with location sharing and everything to do with smacking down Yelp using the force of a thousand suns. Earlier this summer, Foursquare announced that it would be splitting its main app into two separate experiences: Swarm for social location sharing, and Foursquare for personalized location recommendations. Swarm launched a while ago, and though the app has shown growth, there are still plenty of folks out there that miss the old Foursquare and, hating change, hate Swarm along with it. But a look at the new Foursquare might change that. If you’re feeling personally or sentimentally attached to the old foursquare, it’s in your best interest to let go now. It’s over. The new Foursquare looks and feels completely different, with a new flag-pole, superhero-themed logo, a new blue and pink color scheme, and one very familiar puzzle piece missing, the check-in. In fact, in the new foursquare, there is no location sharing at all. When you first sign up for the app, users are sent to a screen that shows a number of “tastes.” These might include “Spicy Tuna”, “deep dish pizza”, or simply “cheddar cheese.” It’s a similar on-boarding experience to the Beats Music app, but with foods instead of music preferences. Once you’ve added tastes, you’re sent to a main home page. The app finds your location and gives you a sliding header bar with options for breakfast, brunch, lunch, dinner, snacks, nightlife, shopping, etc. As you scroll through these recommendations, the new Foursquare feels a lot like a restaurant blog, with various featured sections based around your personalized tastes. So, for example, if you’re looking at nightlife, it might make various suggestions for different categories like Dive Bars or Fancy Cocktails. The suggestions themselves, and the categories, are both based on the information you’ve given Foursquare about your preferences. When you click into an establishment, you’re given basic information about that place like phone number, address, and some photos. Plus, you’re given a series of “tips”, which are the equivalent of a Yelp review but if Yelp users were given a word maximum. Tips are short and sweet, and the ones that come from your friends or people you follow will surface higher and help inform the recommendations you’re given. 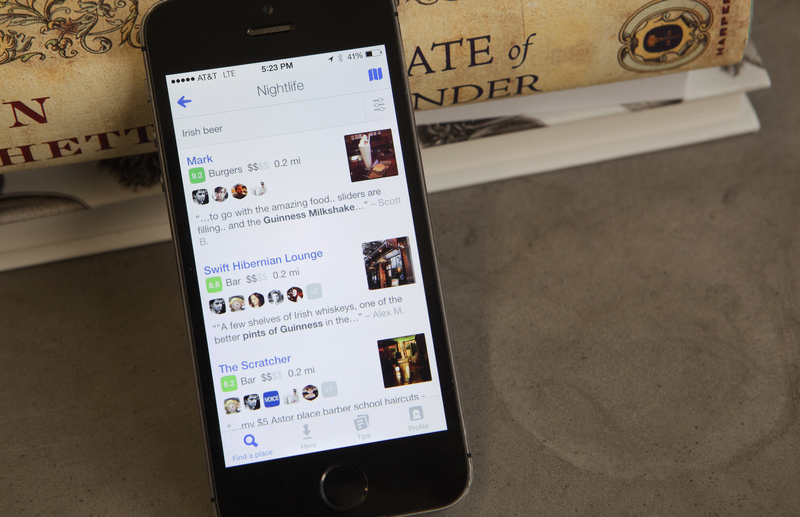 Alongside the passive search that happens each time you open the app, users can also do their own search on Foursquare. Results come up in a list view by default, but users can toggle a map with a button on the top right corner to see search results relative to their location. A “What’s Here” tab on the bottom also brings up a list of the best spots around you, based not only on your preferences but tips from other users. If you were to pull someone through the space-time continuum into our world, and this person had never before used a location-based recommendations/search app, they would probably choose Foursquare over Yelp, based on aesthetics alone. Unfortunately for Foursquare, Yelp is an ingrained behavior for a big chunk of the audience they hope to capture. Still, using the new Foursquare instead of Yelp for the past few days has felt like upgrading from a BlackBerry Bold to an iPhone 5s. That said, most searches (both passive and active) brought up a lot of the same results. In other words, Foursquare isn’t using some backdoor algorithm to surface the most exclusive, secretive, hottest places in New York. When I search for pizza in Williamsburg on both apps, I see all the same stuff. Still, the way the content is presented within Foursquare has two advantages over that of Yelp. To start, it’s just prettier. And more importantly, it is generally more useful. That’s not to say that Yelp reviews and ratings aren’t somewhat useful, but we’re all aware of the inconsistencies with that system. Establishments can buy good reviews, and as we’ve learned recently, they can even fine folks for leaving bad reviews. Plus, as a species, we’re far more inclined to take action when we’re leaving a negative review than to praise a restaurant after a delicious meal. And if that weren’t enough, the people leaving information on Yelp are strangers. With Foursquare, your searches and passive recommendations are based around personalizations that you’ve specified, as well as a follow-based interest graph. See, Foursquare asks you to follow people who you might trust for recommendations on what to do, where to eat, etc. This means you can follow one of Foursquare’s launch partners like TimeOut, the Washington Post, or the LA Times, as well as your friends to ensure that you know why a certain place is good, not just that a lot of strangers think it’s good. Alongside the added credibility of the follow structure, Foursquare also asks users to leave tips on places that look and feel more like a tweet than anything else. Yelp reviews end up reading like long-winded horror stories narrated by bad fiction writers, whereas Foursquare tips are boiled down to a few words expressing approval or disapproval. The logic behind splitting up the main foursquare app into two different experiences is sound. We sat down with Jon Steinback, VP of product experience, to learn more. Still, the process by which any software company totally pivots its products is a difficult one, no matter what. In the case of Swarm, the theft of the check-in was a slow, painful one. It’s as if I came into your house, put on all your jewelry, and sat down on the couch for a sandwich and an episode of Veep before leaving with your most prized possessions. That said, people aren’t happy. The Swarm app has a 1.5 star rating on the App Store, and folks have even built a Kill Swarm Twitter feed to fight the shift. But Foursquare and Swarm can play nicely together for those who love both sides of the Foursquare experience. For instance, Foursquare pulls in your check-ins and asks if you want to leave a tip on them. It also uses Swarm check-ins to make better suggestions. With the launch of the new Foursquare today, the team can now devote more time to improving the Swarm experience. Unlike the new Foursquare, which is based around the original app and using much of the same data, Swarm was built from the ground up. Steinback explains that the team is still working out bugs and other small issues, but that gamification is certainly in the pipeline for Swarm. If you remember the old Foursquare, you remember that the search box was a very small piece of the app, while the check-in was front and center. This made me wonder why the new Foursquare, based around recommendations, gets to keep the original moniker while the check-in is re-debuted in a brand new app called Swarm. Steinback revealed, however, that despite the backlash among some users, Swarm is seeing that 90 percent of the users who were actively checking in on the old foursquare are checking in on Swarm. Obviously, there’s a bit of a road ahead for Foursquare in terms of educating users about their new products and ensuring that their loyal users are pleased with the new experiences. But even if the change is hard, it’s necessary. The old Foursquare was losing in a big way, and by splitting up the use cases, Foursquare is not only trying to solve its own problem but hopping into the ring with a player (Yelp) that is in need of some disruption. 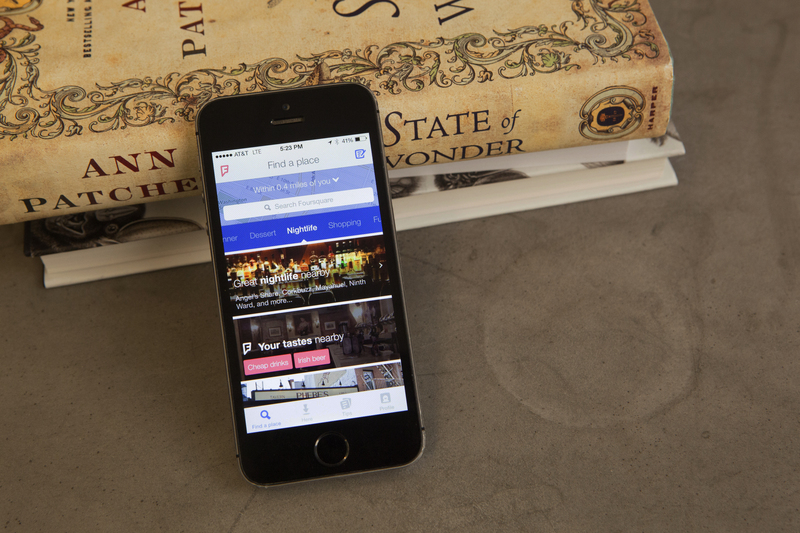 The new Foursquare will be available around noon ET today in the App Store and Google Play.